The ultimate goal of wound management in periodontal surgery is a tension-free primary wound closure which reduces postoperative problems, healing time, and the risk of bacterial contamination of the wound area to a minimum. Modern minimally invasive, microsurgical concepts using multilayered suturing approaches with thin monofilament suture materials facilitate primary wound closure and increase the predictability of an undisturbed primary wound healing. The major goal of postoperative care is - besides reduction of the postoperative patient-related problems - a stringent infection control of the operated area. This comprises the application of antiseptic mouthrinses by the patient as well as the monitoring and cleansing of the wound by the dentist at short intervals. For long-term protection of the healing result, supportive periodontal therapy is necessary, which is provided at regular intervals according to the individual treatment needs of each patient. Bacteremia is a common occurrence in patients with periodontal diseases, even simple gingivitis. Tooth brushing, especially improper and/or overzealous tooth brushing, routinely occasions a significantly perceptible elevation in the quantity of oral-origin microorganisms in the circulating blood. Initial therapy, whether a routine prophylaxis in a gingivitis case, or scaling and root planing in a periodontitis patient, always leads to bacteremia, often massive; hitherto, most such bacteremias have been assumed to be both transient and inconsequential for the patient's systemic health. This assumption is no longer tenable in the light of new clinical and scientific knowledge. The purposes of the present article are: 1) to critically review the contemporary use of antimicrobial agents in dental and dental hygiene practice in the USA and internationally; 2) to revisit and review the peculiarities that characterize inflammatory gingival/periodontal disorders which may demand more aggressive use of antimicrobial agents now and in the future; and 3) to conceptualize the emerging treatment concepts that are targeted towards treatment of gingival/ periodontal diseases as acutely contagious clinical entities. Fujii, Takeo/Wang, Pao-Li/Hosokawa, Yoichiro/Shirai, Shinichi/Tamura, Atsumu/Hikita, Kazuhiro/Maida, Takeo/Ochi, Morio/Baehni, Pierre C.
Azithromycin is a macrolide which possesses a strong antimicrobial activity against Gram-positive and Gram-negative pathogens. In the present study, we studied the effect of azithromycin as an adjunct to non-surgical treatment in early onset aggressive periodontitis. Initial treatment consisting of oral instructions and full-mouth scaling and root planing was performed over a 2-month period. Patients were then administered with azithromycin, 500 mg per os, 1x/day, for 3 days. Professional mechanical tooth cleaning was performed once every two weeks during the initial preparation. Initial treatment was considered as completed when the gingival index was < 1. The probing pocket depth, percentage of periodontal pockets with depth >= 4 mm, and the rate of bleeding on probing improved following treatment. The duration of the treatment was 4.7 ± 3.2 months. Another group of patients received the same initial treatment but without azithromycin. The duration of the treatment for this group was 11.2 ± 4.9 months. These results indicate that azithromycin may be useful for the treatment of early onset periodontitis. The aim of the present study was to present results after six months following the treatment of intrabony defects with Emdogain-TS®. Twenty-six intrabony defects were treated with enamel matrix proteins (EMD) and PerioGlas® (Emdogain-TS®, Institut Straumann AG, Waldenburg, Switzerland) (EMD-TS®). The following clinical parameters were evaluated at Baseline and at six months after treatment: plaque index (PI), gingival index (GI), bleeding on probing (BOP), probing depth (PD), gingival recession (GR) and clinical attachment level (CAL). The primary outcome variable was CAL. The sites treated with EMD-TS® demonstrated mean CAL changes from 9.0 ± 2.0 mm to 5.9 ± 1.4 mm (p<0.001) at six months. At six months, the mean PD was reduced from 7.5 ± 1.6 mm to 3.7 ± 1.0 mm (p<0.001), and the mean GR increased from 1.5 ± 1.2 mm to 2.2 ± 0.9 mm (p < 0.001). It can be concluded that the treatment of intrabony defects with EMD- TS® results in significant improvements of the investigated clinical parameters. The diagnosis "aggressive periodontitis", defined by the International Workshop for a Classification of Periodontal Diseases and Conditions in 1999, refers to the multifactorial, severe, and rapidly progressive form of periodontitis, which primarily - but not exclusively - affects younger patients. Direct and indirect bacterial effects influencing the host immune response play a significant part in the etiology of aggressive periodontitis comparable to chronic periodontitis. In addition to various virulence factors of specific periodontal pathogens, a genetic predisposition influences the outbreak and progression of the disease. After diagnosis, which should be made as early as possible by clinical and microbiological diagnostics, the usual treatment methods include: mechanical debridement as well as the supportive use of antibiotics, in some cases guided tissue regeneration methods. In addition, the dentition has to be reconstructed functionally and esthetically restorations or implants. 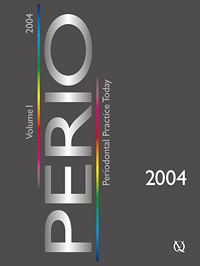 A long-term success of therapy demands an appropriate periodontal maintenance. The aim of the present report was to clinically and histologically investigate the healing of advanced intrabony defects in humans following access flap surgery with root surface and defect debridement using an Er:YAG laser. Six patients, each of whom displayed one advanced intrabony defect around teeth or roots scheduled for extraction, were included in the study. The defects were treated with access flap surgery followed by root surface and defect debridement with an Er:YAG Laser (KEY2® KaVo, Biberach, Germany) (160 mJ, 10 pulses/s). The following clinical parameters were recorded at baseline and at 6 months: probing pocket depth (PD), gingival recession (GR) and clinical attachment level (CAL). Healing was uneventful in all cases. Six months after surgery, the teeth or roots were extracted together with some of their surrounding soft and hard tissues and processed for histologic evaluation. Clinical examination revealed PD reduction and a CAL gain in all six cases. The histologic evaluation revealed that healing was predominantly characterized by formation of a LJE along the instrumented root surface. Formation of a new connective tissue attachment (i.e. new cementum with inserting collagen fibers) was observed in two out of the six specimens. New connective tissue attachment was also accompanied by bone regeneration in one of these two specimens. There was no evidence of laser induced thermal side effects in any of the evaluated specimens. Within its limits, the present study failed to show predictable periodontal regeneration in advanced human intrabony defects following access flap surgery with root surface and defect debridement using an Er:YAG laser. Petersilka, Gregor J./Flemmig, Thomas F.
Biofilm and calculus removal are very important components of periodontal therapy, and a variety of instruments may be used for debridement purposes. In recent years, the application range of sonic and ultra sonic scalers in such debridement procedures has been extended to the subgingival area as slim instrument tips allowing good access to the root surfaces have been developed. Treatment using oscillating scalers offers greater patient and operator comfort, and their treatment outcomes may be as successful as with hand instruments. However, a thorough knowledge of instrument function and profound clinical skills are necessary to allow safe, efficient application of these instruments. The purpose of this study was to compare conventional local anesthesia with a newly developed anesthesia technique, called anterior middle superior alveolar nerve block (AMSA) for non-surgical periodontal therapy (scaling, root planing). Twenty patients with chronic periodontitis (8 females, 12 males; mean age: 45 ± 8.5 years) with good general health received non-surgical periodontal therapy in the upper jaw under local anesthesia. The local anesthesia was performed according to a split-mouth design with either AMSA or with the conventional palatal infiltration technique. Pain response was recorded and evaluated with a standardized visual analogue scale (VAS) ranging from 0-10. The results of the present study showed a statistically significant lower level of pain (p< 0.001) for local anesthesia with the AMSA-technique, compared to conventional palatal anesthesia. Moreover, the AMSA-technique resulted in a complete anesthesia of the vestibular gingiva in the area delineated by the upper first incisors and first molars. Patient acceptance was significantly higher with the AMSA-technique than with conventional local anesthesia. No adverse side effects such as necrosis, swelling or wound-healing complications, which could be related to the local anesthesia, were observed.